Central Oregon boasts some of the most spectacular scenery in the country, making a Bend, Oregon motorcycle tour the perfect way to spend some time during the summer or early fall. Your one-stop-shop for dual sport motorcycle rentals, dual sport tours in Central Oregon, and dirt bike tours near Bend, Oregon. Ride bikes you would not buy, but would love to ride. Many brands, street & dual purpose. 7 nights - 7 bikes is a popular package w/some meals. Enabling the Moto-Addicted. Single day, multi day and trip planning for motorcycle trips in and around beautiful Oregon. Tour the 296-mile Dalles-California Highway, Central Oregon’s primary north-south roadway. View the phenomenal scenery along the Santiam Highway, which passes through two national forests. Ride past numerous sparkling alpine lakes on the famous Cascade Lakes Highway. Hire a motorcycle tour guide to show you the best routes and the most memorable highlights. With the majestic Cascade Mountains, alpine lakes, and lush forests to the west, and beautiful high desert country to the north and east, Bend is surrounded by breathtaking natural beauty. This makes it a great place to take a motorcycle tour during the summer or early fall. If you don’t own a motorcycle you can easily rent one to tour the area on your own. Professional guides are also available to take you on the best routes and point out highlights along the way to ensure a memorable trip. 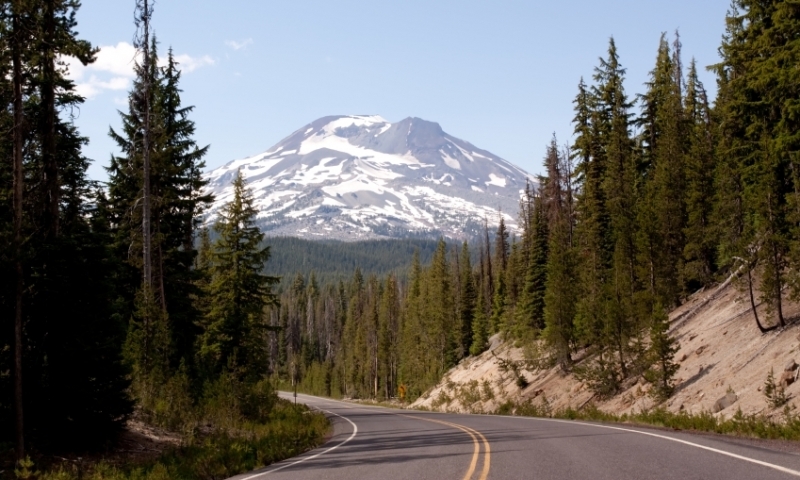 Cascade Lakes Highway – This 66-mile two-lane road boasts incredible views of several Cascade volcanoes and sparkling alpine lakes. You’ll pass by Mt. Bachelor just west of Bend and continue along the edge of the Three Sisters Wilderness. Stop and fish for “crane bows” at Crane Prairie Reservoir, or stop and have a picnic near one of several beautiful lakes as you ride along. Santiam Highway – Truly one of Central Oregon’s most scenic roadways, the Santiam Highway stretches for 100 miles and passes through two national forests, numerous alpine lakes, fascinating rock formations, and lush meadows filled with colorful wildflowers. McKenzie Highway – An 88-mile scenic stretch west of Bend, the McKenzie Highway takes you through Three Sisters Wilderness to the south, and Mt. Washington Wilderness to the north. Further west takes you along the McKenzie River and across one of Oregon’s most famous covered bridges. Dalles-California Highway – This 296-mile north-south roadway – more commonly known as Highway 97 – goes right through Bend as it stretches between the California and Washington State Lines. Heading south will take you past the Newberry Volcanic National Monument, through the picturesque resort community of Sunriver, and past one the largest freshwater lakes in the western states. North of Bend you’ll see the spectacular Crooked River Gorge and the Crooked River National Grassland – a great place to view wildlife. Willamette Highway – Southwest of Bend, this beautiful roadway stretches for 86 miles through lush forest as it crosses the Cascade Range. Salt Creek Falls, at 286 feet, are one of the main highlights of this scenic route. While you’re planning your Bend, Oregon motorcycle trip, be sure to check out the various motorcycle guides and outfitters listed on this web page.